Mystery shoppers to nominate shops that fulfil toy campaigner’s good practice criteria. Let Toys Be Toys, the parent-led campaign that aims to see ‘boys’ and ‘girls’ signs removed from toy shops and websites, has announced the launch of a good practice Toymark: to be awarded with the help of mystery shoppers. Campaign supporters have been asked to nominate shops that fulfil the campaign’s good practice criteria. Stores that meet the standards required will be awarded the Toymark; a badge of quality to help parents choose shops with displays that welcome children generally and which do not divide toys – or children – by gender. Megan Perryman, a Let Toys Be Toys campaigner, said: “As parents we know that gender labels are confusing and send the wrong messages to children. Toys should be labelled or displayed by theme, age or activity; there should not be any signposting for “Girls” or “Boys” – and that includes gender filters on websites; and there should not be any display signage that implies that certain toys are for boys or girls only, fo rexample by pink/blue colour-coding. 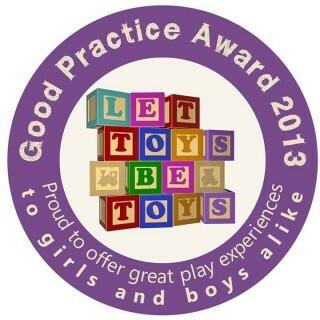 Petit Chou, for example, an independent toy shop just off London’s Oxford Street, gets top marks from campaigner Tessa Trabue for its gender-neutral displays, and she has nominated the store for a Let Toys Be Toys good practice “Toymark” award. If you would like to become a Let Toys Be Toys “Mystery Shopper” and nominate a shop for a Toymark, please drop us an email. The Toymark scheme is a change of tack for the Let Toys Be Toys campaigners who, up to now, have applied public pressure to retailers to remove gendered signs and labels. Boots, Tesco and The Entertainer are among those who have agreed to make changes. While they intend to keep the pressure on shops with gendered signage, Let Toys Be Toys say the Toymark is a way to reward those retailers who do not use gender stereotypes, as well as help adults and children find gender-inclusive shops. Let Toys Be Toys campaigner Leanne Shaw said she was really excited about the Toymark scheme. “As a supporter of Let Toys Be Toys it’s good to have something positive to shout about, and as a parent I’m looking forward to checking out some of the award winners during the summer holidays. “It will be good to know I am spending my money in shops that allow both my children to make their own choices, free from gendered marketing”. Let Toys Be Toys is a grassroots consumer campaign, run and organised wholly by volunteers, calling on retailers to stop limiting children’s interests by promoting some toys as only suitable for girls, and others only for boys. You can help by signing the Let Toys Be Toys petition on change.org, asking retailers in the UK and Ireland to remove gender labels, and organise toys by theme and function.